Zeppelin Jailbreak Tweak has now been Optimized for iOS 7! Although it is now very much easy to jailbreak your Apple device, it is almost useless if you do not find any compatible iOS 7 apps, mods and tweaks. However, we are finding more and more iOS 7 optimized tweaks and apps regularly. 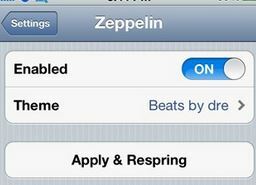 The recent addition is the very famous jailbreak tweak “zeppelin”. Download this free Zeppelin iOS 7 from Cydia Store and enjoy this iOS 7 optimized jailbreak tweak’s logos.